Onkyo DP-X1 review | What Hi-Fi? Of all Shakespeare’s risqué puns, none has become more of a truism in a wider context than having ‘too much of a good thing’. Take vitamins, power, pizza, and sugar canes at Christmas, for instance. But in an era of compulsive hoarding, we can never have too much storage. So if your worst nightmare is a ‘memory full’ notification, you might want to check out the Onkyo DP-X1 hi-res portable music player. With 432GB of storage available, the death of the 160GB iPod Classic doesn’t seem so bad now. And we thought the potential 264GB storage of the Award-winning Astell & Kern AK70 was impressive! Only 32GB of it is built-in, but each of the Onkyo’s two microSD slots can support a 200GB card. Sure, you’ll have to pay extra for that, but it means you have room for over 2000 24-bit/192Khz FLAC files, almost 11,000 CD-quality WAVs or roughly 108,000 MP3s. Packing two Sabre 9601K amps and dual Sabre ES9018K2M DACs, the Onkyo can cater for them all: PCM files up to 24-bit/384kHz and DSDs (11.2/5.6/2.8MHz). A recent firmware also mean the Onkyo can support Master Quality Authenticated (MQA) files, hi-res music packaged into smaller files that are easier to download (or stream) – ideal for those interested in hi-res audio but planning to make do only with the DP-X1’s internal storage. It’s not on its own with the expansive storage, vast file compatibility and MQA support – the Pioneer XDP-100R has similar specs – and a similar look, echoing the Onkyo’s chunky casing, volume dial on the left side panel and other playback buttons and microSD card slots on the right. It looks and feels like a giant next to the Astell & Kern AK70, and can only just be deemed pocket-friendly. It’s not thumb-stretchingly wide, but the edges aren’t as smooth or tapered as we’d like, and dig in when you’re sat down. Still, it feels well made and the subtle moulding of the rear panel to accommodate the volume dial, not to mention the bright and colourful 4.7in touch panel display, keeps it at the classier end of the market. Onkyo is seemingly on a hi-res music mission, turning out everything from compatible portable music players to headphone amps to match its hi-res digital download store, Onkyo Music. The DP-X1 runs Android Lollipop 5.1.1 OS, so if you’re connected to wi-fi you can download that – and other apps, including Spotify, Tidal and Facebook – from the Google Play Store. The Onkyo may seem a little out of touch considering Android’s OS is now two confectionary versions on, but it’s still a smooth operator and even for a novice, it’s difficult to go far wrong with the clean, intuitive interface. The menus are organised and pleasingly free of bloatware, and the pull-down toggle bar is a handy shortcut for accessing wi-fi, line out mode and Bluetooth. The latter handy for playing music through wireless headphones or speakers, although there are multiple options for a wired connection: a standard 3.5mm plug-in, and either balanced or active ground connections via the 2.5mm output. Onkyo’s music app is the access point of your music library. The interface comprises multiple tabs along the top: from artists, albums and songs to playlists, genres and formats, with the idea being that you can simply swipe across to each one, with your library listed below accordingly. There’s a search bar, and you can browse songs by whether they’re stored internally or on a microSD card. The playback screen, a jazzy fusion of yellow on black with album art in the background, manages to be informative without being cluttered. Track info is supplemented by clearly highlighted file type and size, and drop down menus in the top corners offer easy access to queues, playlists and settings. A central circle showing track playback dominates the screen, but we find the arrows either side for track skipping are too close. On a number of occasions we unintentionally skipped further through a track instead of past it, and vice versa. Onkyo says the DP-X1’s 1630mAh battery gets you about 16 hours playback of hi-res FLACs or 18 hours playing CD-quality 16bit/44.1kHz files. If you listen to a diverse range of file formats and sizes, pretty loudly, and use wi-fi and apps occasionally, that’ll probably be more like ten hours. While the Onkyo’s volume goes up to 160 increments, it isn’t capable of the ear-ringing levels of the Astell & Kern. Still, the Onkyo sounds more than comfortable at its loudest thanks to the spaciousness and neutral tonality of its presentation. With the talent of a keynote speaker, the Onkyo is all about getting the message across. Three digital filters are at your disposal: sharp, slow and short. The differences aren’t huge, but ‘sharp’ certainly has the edge, opening the presentation and delivering a touch more sparkle. Play Mike Oldfield’s Pran’s Departure and it rises to the orchestration’s monumental climax to give it its epic due, pushing the instrumentation to the very corners of its sizable soundstage. There’s room for them to breathe but not so much that they feel disconnected from one another; the violins, woodwinds and percussion are a tight fit without figuratively bumping into one another. The orchestration’s incremental build and large dynamic sweeps are deftly communicated, and each gesture offered by the string section is relayed with precision and insight. The opening high-pitched xylophone notes twinkle across the generous headroom, and while bass notes aren’t as rich or full as they are through the Astell & Kern, they have substantial presence and depth to get across the composition’s sorrowful undertone. Mids are successful in their bid not to be the weakest link in the frequency range; the lush harmonies and characteristic warble of Joni Mitchell’s drifting vocal in My Old Man are confidently carried, and the piano flows behind fluidly with good dynamic distinction. There’s an inkling of restraint and pianissimo to the heavily accented notes however, and that lack of punch is confirmed as we play Elvis Costello’s This Year’s Girl. We’d like more welly behind the idiosyncratic drumbeats, and more push from the Onkyo to drive the infectious melody forward. The Onkyo hardly feels bereft, but it lacks the sonic solidity of the Astell & Kern, whose presentation benefits from having that firmer foundation. The DP-X1 takes silver where subtlety and rhythms are concerned too, its rival better at expressing not only the edges of notes, but their core too, and driving rhythms with greater tact and togetherness. To its rivals, the Onkyo DP-X1 is the annoying friend who has everything. Its storage potential, of 432GB, arguably may as well be unlimited; it’ll play almost anything from MP3s to DSD 11.2Mhz files; and it has the advantage of MQA compatibility. For features, you’re getting your money’s worth. The same can’t be said quite as emphatically for sound quality. 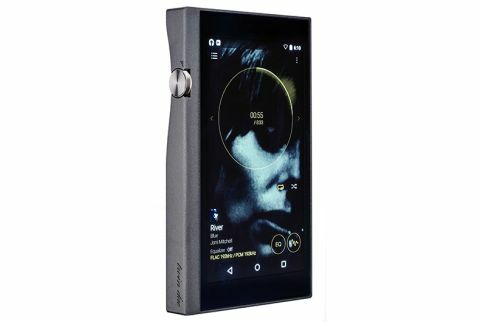 While impressively clear, spacious and balanced, it doesn’t quite match the solidity or rhythmic ability of our current Award winner, the more affordable Astell & Kern AK70. And for that, it can’t quite get over that fifth-star hurdle.